22nd Mar 2019 - Are we up a Gum Tree? As MP's - They could have voted for the PM's deal, but they rejected it, twice. They could have voted for no deal, but they rejected that, twice. They could have voted for a second referendum, but they refused. They could have voted for a softer Brexit, meaning a customs union, a Norway-style relationship, or a combination of the two. But they refused to do that too. All they have decided is to extend Article 50 if necessary!!!! The Prime Minister is often accused of kicking the can down the road, but she is not alone: that is all MPs can agree to do. Even when MPs have had the chance to take control of the Commons timetable, which would allow them to find a way of expressing their preferred outcome, they have fluffed it. Whatever we think of the actions of the Speaker - as partisan as he is pompous, as venal as he is vain - his procedural chicanery is not really the issue. The difficulty is that MPs, whose job is to decide on important matters, cannot make up their minds!!!! The above comments are taken from an article by Nick Timothy former Downing Street Chief of Staff and columnist for the Daily Telegraph. Ever louder voices in Germany are denouncing the Brexit Withdrawal Agreement as a fundamental failure of European statecraft that can lead only to a diplomatic debacle and festering animosity. If the EU's ultimatum policy causes a geostrategic rupture with a pillar of the European defence, security, and financial system - sooner or later, as it surely must under the existing terms - the recriminations in Berlin will be ugly. "Europe is well on the way to inflicting huge damage on itself for decades by the way it has handled the failed Brexit talks," said Marcel Fratzscher, head of the German Institute for Economic Research (DIW) in Berlin. Professor Fratzscher says the EU is undermining its own democratic legitimacy by demanding that Westminster MPs swallow the Barnier package with a "gun to their chest" and subject to threats of "catastrophic consequences" after two-thirds have already rejected it. German business is seriously worried about the prospect of a no-deal Brexit. Scarcely a day passes without a new warning from business leaders. The car industry trade body, the VDA, says no deal could have "fatal" consequences, while the Federation of German Industry (BDI) says it would be a disaster that could cause a "massive crisis". 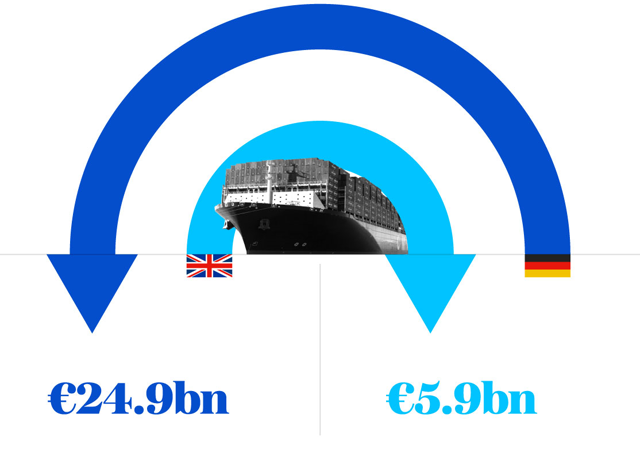 Below: trade between Germany and Great Britain is clearly heavily advantageous to Germany!!!!! 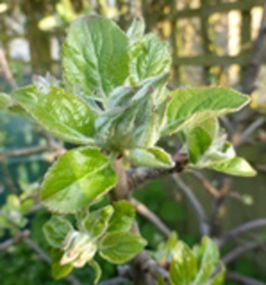 Getting back to apple trees; on this date, the fruit bud development over the last three years is 'as is so often' variable. In 2017 the Bladon Pippin trees in my garden were in advanced Green Cluster stage. 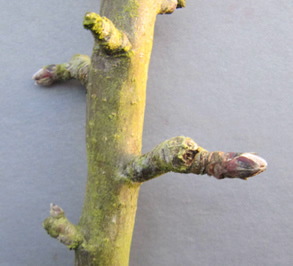 In 2018 the buds were just swelling and this year 2019 the Bladon Pippin are circa 'bud burst' stage. Below: Left to Right: Bladon Pippin at advanced green cluster in 2017 - Bladon Pippin at bud swell stage in 2018 and Bladon Pippin at bud burst stage (today) 2019. >b>Continuing apple growing and looking at future tree management systems: I place on-line two of Stuart Tustain's youtube explanations of the research in New Zealand into maximising light interception and the potential to raise yields from 100 tonnes to 180 tonnes per hectare! Stephen Michael Alley (known as Michael, Mike, Mick) - 15th March 1932 - 3rd March 2019 - On Wednesday, The English Apple Man joined those paying their repects to Michael at his funeral service at St. Nicholas Church Sandhurst in Kent less than one mile from his home at Downgate Farm. Michael was much loved by his family, friends and fruit industry colleagues; St. Nicholas Church was full, as one might expect for the memorial service to this very special man. Tributes were made by his cousin Andrew Brice and his friend Peter Davidson. Andrew who enjoyed a close relationship with Michael from childhhood, relived many happy memories of family life and Michael's journey from school, via his days as a student studying engineering, to his first steps into fruit growing. Peter who was asked by Michael to add 'a couple of minutes' to the memorial tribute said; two minutes? impossible! Peter reflected on the social and sporting activities Michael enjoyed with great enthusiasm; Tennis, Golf, Bridge and holidays Michael and Sue had with Peter and his wife and another great friend John Scott and his wife. One story of a holiday in Russia which included a visit to St. Petersburg where the group visited the Rasputin Museum at Yusupov Palace. Over the years the Moika Palace has served as an educational centre and now as a cultural museum, notable for having survived the Revolution and Soviet years relatively intact. In the basement room where the Mad Monk was killed, wax figures recreate his final moments. A visit to the room is included in the afternoon tours. The rest of the building is a showpiece in itself, including a rococo theatre, and many elegantly appointed rooms. Richard Cullen, the author of Rasputin (2010), has argued that the assassination of Grigory Rasputin had been organised by Scale, Oswald Rayner and Stephen Alley: "Rasputin's death was calculated, brutal, violent and slow and it was orchestrated by John Scale, Stephen Alley and Oswald Rayner through the close personal relationship that existed between Rayner and Yusupov." On 7th January 1917, MI6's Stephen Alley wrote to John Scale in Romania: "Although matters have not proceeded entirely to plan, our objective has clearly been achieved! During their visit to the basement, it was mentioned to the caretaker; "you are in the presence of Michael Alley, whose Uncle Stephen Alley was in MI6" at the time of Rasputin's demise - This caused much excitement and Michael was asked to pose for photographs with the waxwork figure of Rasputin. As Andrew Brice and Peter Davidson 'attested' - Michael was fun, a tease, great company and even after suffering serious illness over the last few years of his life, managed to retain those virtues. His testimony; "I have had a great life"
Following Michael's funeral service, many mourners gathered at Downgate for refreshments and an opportunity to extend personal condolences to Sue and the 'four generations' of the Alley family and reminisce over the many happy memories of Michael with each other.